What you're looking at is the deck of the U.S.S. Ronald Reagan covered in the vehicles of Navy Sailors heading to Naval Base Kitsap in Bremerton, Washington. At a cost of about $4.5 billion this is probably the world's most expensive parking lot. 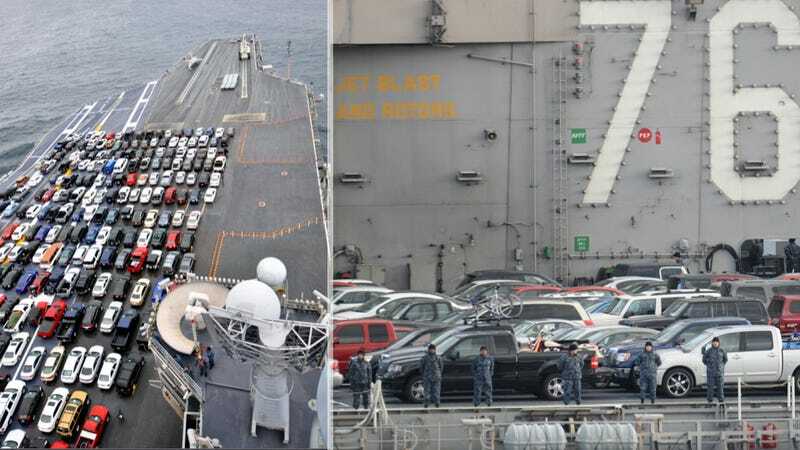 It may seem phenomenal, but this is actually a common occurrence for the Navy and a lot cheaper and easier than transporting the vehicles almost any other way. The weight of one E-2C Hawkeye is approximately 43,000 pounds, or about 12 cars, and a Nimitz-class carrier usually carries four of those. But more to the point, this does save the U.S. Navy money. First, the only other way to get vehicles owned by Navy sailors to their final destinations is to put them in another ship. Second, if they didn't send soldiers' vehicles they'd have to pay for transportation at the final destination. Both of which would absolutely cost more money. The U.S.S. Ronald recently served in Asia and was en route to Kitsap for upgrades and repairs.